The Black Front (Dutch: Zwart Front) was a Dutch fascist movement active before the Second World War. The front grew out of the southern section of the General Dutch Fascist League, with regional organiser Arnold Meijer quarrelling with leader Jan Baars in 1934 and leading his followers out. The Black Front emerged and soon took over a number of smaller movements, while also gaining some support among the poorer parts of society. Although similar to its parent movement the Black Front emphasised a more Catholic line, in tune with Meijer's own religious beliefs. Taking its cue in part from Italian fascism it adopted that movement's black shirted uniformed while adding a unique emblem featuring a sword between a pair of ram horns. The group however struggled to gain support from the National Socialist Movement in the Netherlands and in 1940 was renamed as the National Front. 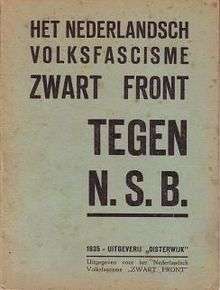 The National Front was ultimately banned by the Germans on 14 December 1941 along with all other Dutch political parties except for the National Socialist Movement in the Netherlands (NSB). The majority of its members switched to the NSB although a disillusioned Meijer left politics altogether.